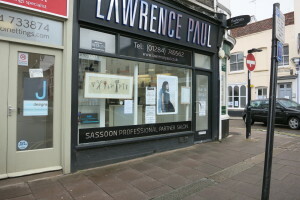 I have enjoyed getting involved in some exhibitions closer to home recently. 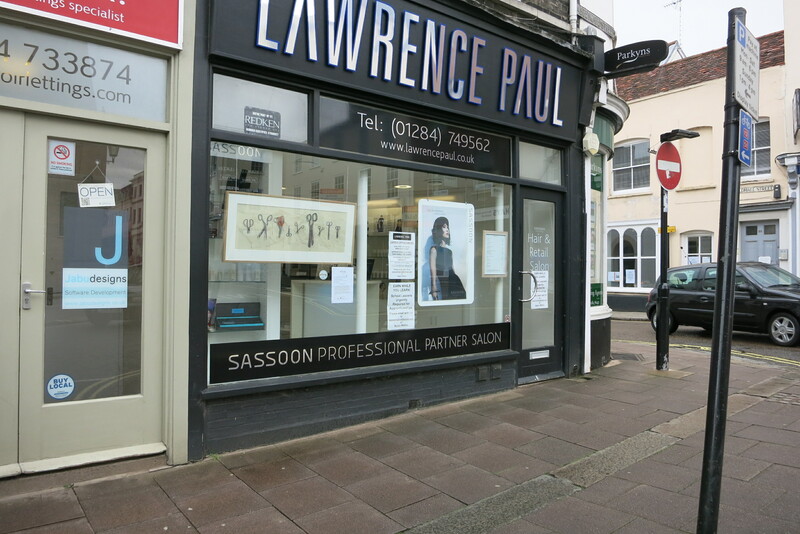 It’s a while since I have shown anything nearby and it is good to rediscover the wealth of history around here as well as reacquainting myself with three female artists – one working over 350 years ago, one working over 250 years ago and one working 80 years ago.. 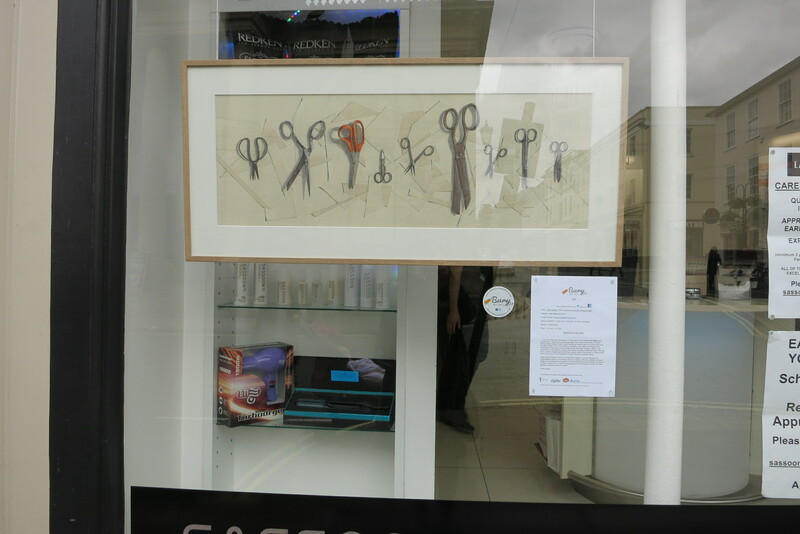 The Bury Festival in Bury St Edmunds, includes a new ‘Art Trail’ where contemporary artists’ work is dotted around the town in shop windows (thanks to Cate Hadley for organising all this). They all look great and seem particularly well matched to their venues. 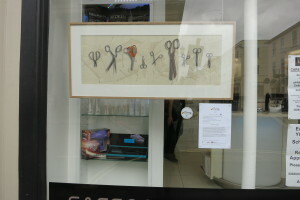 My long painting of scissors seemed quite appropriate for the Lawrence Paul Salon although it was pointed out that it didn’t have any hairdressers’ scissors in it! The ‘Fresh eyes’ exhibition is in both the 12th century Moyse’s Hall Museum and the 21st century, award-winning Apex and shows local artists’ work alongside local museum treasures. 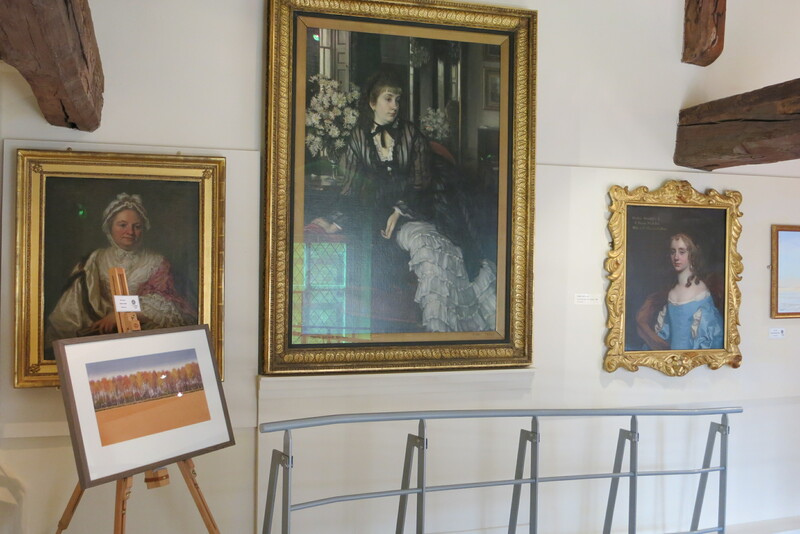 I can’t complain about sitting on an easel at Moyse’s Hall next to work by James Tissot (1836 – 1902), Sir Peter Lely (1613-1680) and Angelica Kauffman (1741 – 1807) – that won’t happen again! Angelica Kauffman was one of only two female artists amongst the founder members of the Royal Academy (RA). The Apex is showing work by another, earlier female artist called Mary Beale (1633 – 1699) who was born in Bury st Edmunds and later worked in London. 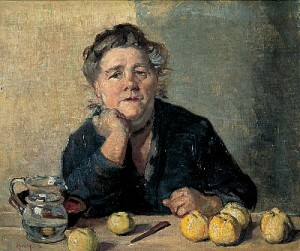 She knew Lely and, amazingly for her time, was a semi-professional portrait painter whose husband became her assistant. So that’s two female artists – Kauffman and Mary Beale – working over two hundred years ago in a very male-dominated world and still showing their work in the 21st century in Bury st Edmunds, Suffolk. While I was at Moyse’s Hall I also said hello to one of my favourite paintings by another female artist from Bury st Edmunds called Rose Mead (1867 – 1946). It’s a painting of Barbara Stone, c1940, and here it is.